← Wildwood Farms is open again! Every year this building becomes more dilapidated as stormy winds tear pieces of the roof off and every year the roses bloom brightly in great profusion. It is located at the intersection of Poor Farm Road and Franklin Pike in Floyd County at a spot that is identified on the map as Pizarro, a town that no longer exists, but was the hometown of more then a dozen men who entered military Service during World War I. 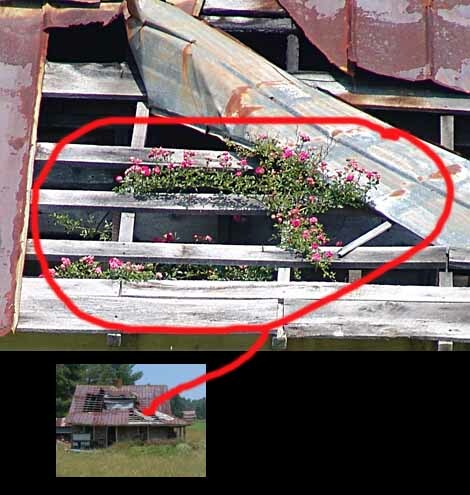 The building provided a variety of useful services for many years and now serves only as a rose arbor. It was in a town that had sufficient vitality and public spiritedness to send at least 13 young men to war in 1917 and 1918. At this time there are probably less than twenty people who live within a mile of this intersection. Only this tired ruin is left to mark what was once a dynamic community, and the roses are slowly taking over. Perhaps the take away lesson is that there will always be a use for everything we’ve built, even if it is not the use we intended. Furthermore, whether it is a house or a carefully tended lawn, nature will start to take over as soon as we turn our attention elsewhere. Even the Pyramids which were among the most massive structures ever built are but a shadow of their former glory. Their polished facades were stolen and dispersed while Europe was still populated by people living in huts and wearing skins. Perhaps that is as it should be. We create places to live and work in and when the time comes to move on to other things, we build anew with different goals in mind. There is a certain poignancy in an abandoned building, as it represents an abandoned dream. But the important thing to remember is that there are always new dreams to pursue. If a dream is no longer viable, maybe it is time to seize upon one that is. This entry was posted in Seen around Floyd and tagged Pizarro Virginia, Poor Farm Road, roses. Floyd Virginia, World War I. Bookmark the permalink. This reminded me that life force cares not what substrate it builds upon – only that life comes to be. What a lovely bit of writing about the dilapidated house that has become a rose arbor. The word pictures and history paint a poignant piece. I have only just found your blog, but it is now a favorite. Lesson: build green. 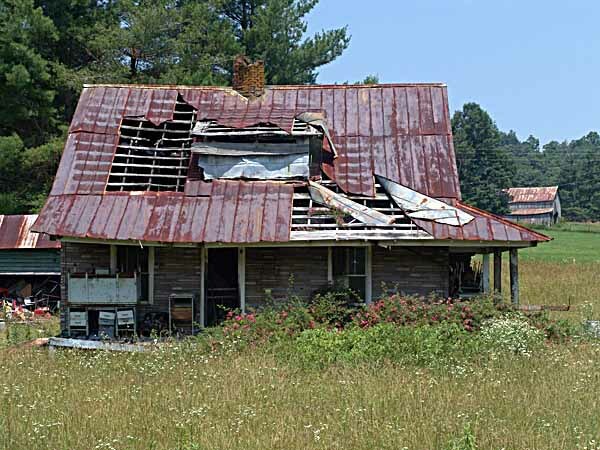 Imagine the historical ruin of the future: a dilapidated house with its vinyl siding, fiberglass shingles and plasticized house wrap… While today we see romantic ruins that invoke thoughts of history (a half mile from my house we have the remnants of a log cabin, with a stone chimney and root cellar – intriging, and a wonderful place to sit and imagine), our grandchildren and their children will instead see shreds of waste… not a pretty picture (pun intended). Question for the day: Why don’t we build more out of stone? (working in europe these days – and I like what I see! ).